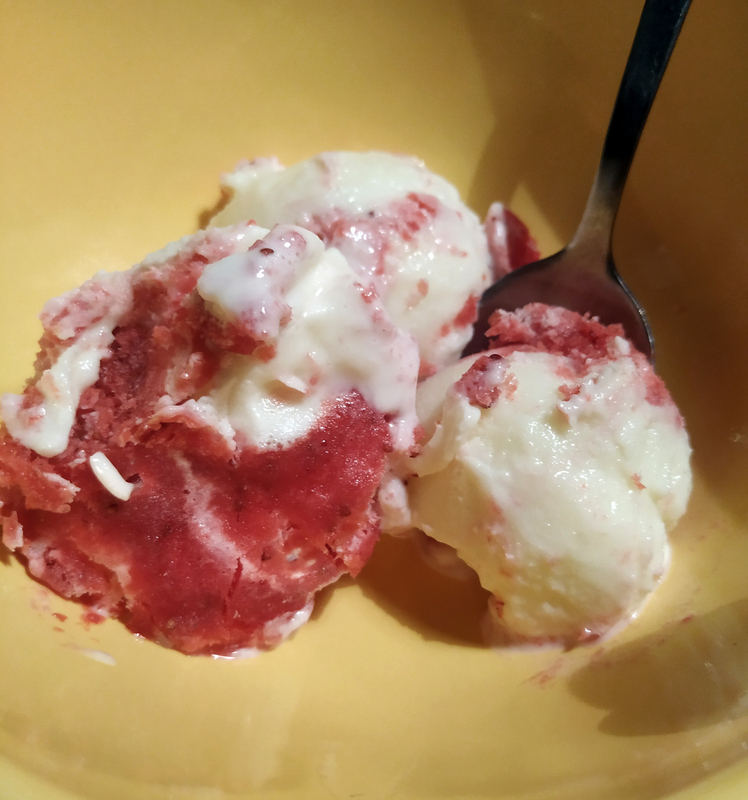 This is a no-churn, no-ice cream maker ice cream but I learned a few tips I need to pass on to you. You have to have really whip the cream in order to get the height and fluffiness from the ice cream. You need to make sure your cream is at least 30% fat or it won’t whip at all. Do not add salt, it will just make it taste salty. Following these rules you too can make ice cream with nearly no effort that tastes really delicious. Pour the cream into a large mixing bowl and use an electric mixer to whip until stiff peaks from. Add the vanilla extract and sweetened condensed milk to the whipped cream and use a spatula to fold everything together until it’s evenly blended. Pour the mixture into a fairly large container, I used a loaf pan, then cover with cling wrap and freeze for an hour. Take the loaf pan out of the freezer and swirl in the strawberry jam then cover with the plastic wrap again, and freeze for at least another 4 hours.